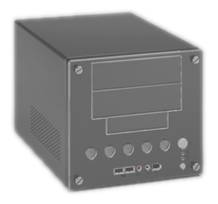 Just because its typically thin clients and home computers that are energy efficient, there’s no reason why you can’t have a low power server PC. The GreenLite Server is a powerful Quad-Core system with an average energy consumption of just 85 Watts, with a peak energy consumption of 127 Watts. The pictured system measures just 8.9″ x 7.9″ x 13″. The GreenLite server is also available as a 2U rack-mounted unit. Inside the box, the server features 2.3GHz Quad Core processor, 4Gb RAM, 2x 1TB SATA Disks (RAID option available), 2x Gigabit ethernet ports, 256Mb ATI Radeon HD 3200 card with HDMI, DVI, and VGA output and Realtek 7.1+2 Channel HD audio. The GreenLite server is compatible with Windows 2003 Server, Windows 2008 Server and most Linux distributions. The energy consumption of the GreenLite server is roughly half that compared to the big brand servers, and just over half the cost compared to the big name servers (based on information on the GreenLite server page). The GreenLite Server Mini Cube costs $1099.99 and the GreenLite Server 2RU Rack costs $1349.99.